Nowadays, it seems every establishment gets reviewed by tourists or regular visitors, who then post their evaluations online. UK prions are no exception to the trend. Whether shared on popular platforms, such as Google or Tripadvisor, the so-called online guides rate establishments on their location, prices, type of food, hospitality, service quality and more. One would normally expect to see advisers recommend restaurants, hotels and bars. And although for most reviewers in Britain it is the case, others choose to also post ratings of bars — prison bars that is. 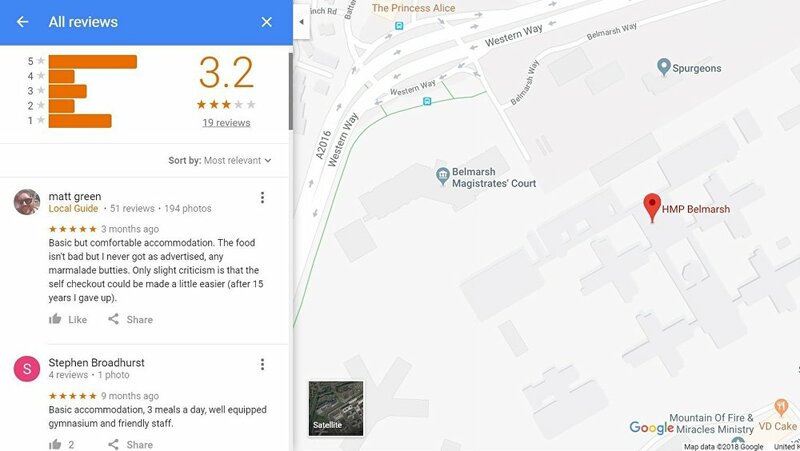 For example, HMP Belmarsh has a rating of 3.2 on Google. Commentators point out that "accommodation" in the prison is "basic" but food is served punctually." HMP Belmarsh is a Category 'A' male adult prison located in south-east London, with the operational capacity of 910 prisoners. Home to a Special Security Unit (SSU), some of the country's most dangerous prisoners are kept in Belmarsh, including individuals awaiting trial for terrorism charges. Under the watchful eye of prison security personnel, Britain's Prince Charles, not seen, tours Belmarsh prison, in southeast London, Thursday Sept. 10, 2009. Reviewer Tom Nel gave the prison four starts and even he "would visit again." "The beds were okay and the food was served punctually. My bunk mate, two-eyes Larry, kept me good company, and only tried to strangle me in my sleep once. Would visit again," he wrote. The north London prison Pentonville has received a higher evaluation from Google users, adding up to 4.3 stars. HM Prison Pentonville, established in 1842, holds 1256 as of 31 August 2017. The establishment has seen a number of escapes, with latest taking place in 2016 when two detainees allegedly cut through cell bars. User Robkb enthusiastically gave Pentonville 5 stars, claiming it was an "excellent facility" and his "favorite place to go for a riot"
Roman Apolenar however complained about the toilet facilities and the limited menu but praised the prison's "price and location." Richie Perera commended the view on the 5th floor. A closed category prison for adult women prisoners of all categories and young offenders, HMP New Hall in West Yorkshire, has left reviewer Tara Cuddihy impressed. "Cracking place amazing people and superb rooms. Would strongly advise a purrfect visit," her review reads. A 3.9 rating has been granted by online users to HMP Thameside, a Local category B establishment in London that can currently hold 900 convicted and remand male prisoners. 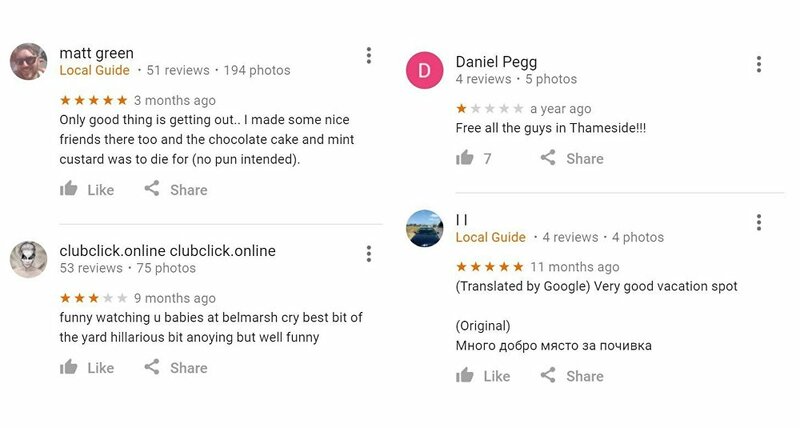 Matt Green, a level 6 Local Guide for Google Maps — a title one earns by making lots of recommendations and leaving numerous reviews — gave HMP Thameside the highest score. Ilyaas Khan, a reviewer of HM Prison Leicester, set the jokes aside, making a recommendation to close down the establishment. "Victorian prison which needs closing down. According to reports it is failing staff and prisoners and needs to close." The most recent inspection of HMP Leicester, one of the oldest prisons in the country, revealed high levels of violence and lack of staffing resources.